And the following article is a must-read. (NaturalNews) Prepare to have your world rocked. What you’re about to read here will leave you astonished, inspired and outraged all at the same time. You’re about to be treated to some little-known information demonstrating why seasonal flu vaccines are utterly worthless and why their continued promotion is based entirely on fabricated studies and medical mythology. If the whole world knew what you’re about to read here, the vaccine industry would collapse overnight. Perhaps its impressive narrative shouldn’t be too surprising, though, since writer Shannon Brownlee is also the celebrated author of a phenomenal book on modern medicine entitled Overtreated: Why Too Much Medicine Is Making Us Sicker and Poorer (http://www.amazon.com/Overtreated-M…) (http://www.naturalpedia.com/book_Ov…). While I’ve never done this before, I’m going to summarize this article point by point (along with some comments) so that you get the full force of what’s finally been put into print. This information is so important that I encourage you to share the following summary I’ve put together. Email it to family, friends and coworkers. Or post it on your blog or website (with a link and proper credit to both NaturalNews and The Atlantic, please). Get this information out to the world. People need to know this, and so far the mainstream media has utterly failed to make this information known. What follows is my point-by-point summary of this groundbreaking article by Shannon Brownlee, originally published in The Atlantic. My opinion statements are shown in brackets and italics. • Vaccination is the core strategy of the U.S. government’s plan to combat the swine flu. • The U.S. government has spent roughly $3 billion stockpiling vaccines and anti-viral drugs. 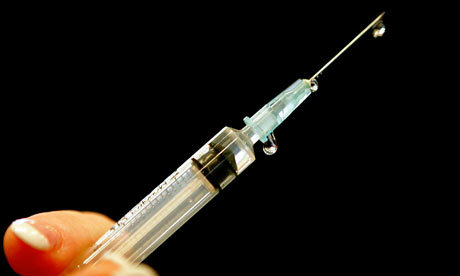 • The CDC is recommending that 159 million Americans receive a swine flu vaccine injection (as soon as possible). • What if vaccines don’t work? More and more researchers are skeptical about whether they do. • Most “colds” aren’t really caused by the flu virus. As few as 7 or 8 percent (and at most, 50 percent) of colds have an influenza origin. There are more than 200 viruses and pathogens that can cause “influenza-like” illnesses (and therefore be easily mistaken for the flu). • Viruses mutate with amazing speed, meaning that each year’s circulating influenza is genetically different from the previous year. • The vaccine for each upcoming flu season is formulated by health experts taking a guess [a wild guess, at times] about what strain of influenza might be most likely to circulate in the future. • The 1918 Spanish Flu infected roughly one-third of the world population and killed at least 40 million. • In the U.S., the President’s Council of Advisors on Science and Technology predicted that H1N1 influenza could infect up to one-half of the U.S. population and kill 90,000 Americans. • Of those who have died from the Swine Flu in the U.S., roughly 70 percent were already diseased with some serious underlying condition such as asthma or AIDS. • Each year, 100 million Americans get vaccinated, and vaccines remain “a staple” of public health policy in the United States. • These studies show a “dramatic difference” between the death rates of those who get the vaccines vs. those who don’t. People who get vaccinated have significantly lower death rates [from ALL causes, and herein lies the problem…]. • Critics question the logic of these studies: As it turns out, compared to the number of deaths from all causes, the number of people killed by influenza is quite small. According to the National Institute of Allergy and Infectious Diseases, deaths from influenza account for — at most — 10 percent of the total deaths during the flu season (and this includes all indirect deaths aggravated by the flu). • So how do the vaccine companies come up with this “50% reduction in death rate” statistic? Through cohort studies. • Cohort studies compare the death rates of large groups of people who received the vaccine to large groups of people who did NOT receive the vaccine. But there’s a fatal flaw in this approach: People self-select for vaccinations. And what kind of people? As it turns out: People who take more precautions with their health! • There is extreme “cult-like” peer pressure put on doctors and researchers to swallow the vaccine mythology without question. Quoted from the story: Lisa Jackson, a physician and senior investigator with the Group Health Research Center, in Seattle, began wondering aloud to colleagues if maybe something was amiss with the estimate of 50 percent mortality reduction for people who get flu vaccine, the response she got sounded more like doctrine than science. “People told me, ‘No good can come of [asking] this,'” she says. “‘Potentially a lot of bad could happen’ for me professionally by raising any criticism that might dissuade people from getting vaccinated, because of course, ‘We know that vaccine works.’ This was the prevailing wisdom.” [In other words, don’t dare question the vaccine, and don’t ask tough scientific questions because the vaccine industry runs on dogma, not science… and if you ask any questions, you might find yourself out of a job…]. • Lisa Jackson was not deterred. She and three other researchers began to study the widely-quoted vaccine statistics in an attempt to identify this “healthy user effect,” if any. They looked through eight years of medical data covering 72,000 people aged 65 or older and recorded who received flu shots and who didn’t. Then they compared the death rates for all causes outside the flu season. • She also found that this so-called “healthy user effect” explains the entire apparent benefit that continues to be attributed to vaccines. This finding demonstrates that the flu vaccine may not have any beneficial effect whatsoever in reducing mortality. • Jackson’s papers were finally published in 2006, in the International Journal of Epidemiology. • If vaccines really worked to save lives, then the more people you vaccinate, the lower death rates you should see, right? But that’s not the case. Back in 1989, only 15 percent of over-65 people got vaccinated against the flu. But today, thanks to the big vaccine push, over 65 percent are vaccinated. And yet, amazingly, death rates among the elderly have not gone down during the flu season. In fact, they’ve gone up! • When vaccine promoters (and CDC officials) are challenged about the “50 percent mortality reduction” myth, they invoke dogmatic language and attack the messenger. They are simply not willing to consider the possibility that flu vaccines simply don’t work. • Scientists who question the vaccine mythology are routinely shunned by the medical establishment. Tom Jefferson from the Cochrane Collaboration is an epidemiologist who questions the claimed benefits of flu vaccines. “The reaction [against Jefferson] has been so dogmatic and even hysterical that you’d think he was advocating stealing babies” said a colleague (Majumdar). • Vaccines supposedly “work” by introducing a weakened viral strain that causes the immune system to respond by building influenza antibodies. However, as Jefferson points out, only healthy people produce a good antibody response to the vaccine. And yet it is precisely the unhealthy people — the ones who have a poor immune response to the vaccine — who are most at risk of being harmed or killed by influenza. But the vaccines don’t work in them! • On the anti-viral drug front, hospitals are urged to hand out prescriptions for Tamiflu and Relenza to almost anyone who is symptomatic, whether they actually have swine flu or not. Concern is growing about the emergence of drug-resistant strains of swine flu. ” Flu can become resistant to Tamiflu in a matter of days…” says one researcher. • In 2005, the U.S. government spent $1.8 billion to stockpile antiviral drugs for the military. This decision was made during the time when Donald Rumsfeld was Defense Secretary. Rumsfeld also held millions of dollars worth of stock in Gilead Sciences, the company that holds the patent on Tamiflu. That company saw its stock price rise 50 percent following the government’s stockpiling purchase of Tamiflu. Tamiflu is already linked to 50 deaths of children in Japan. The evidence supporting Tamiflu is based on cohort studies, just like the vaccines, which may distort or exaggerate the apparent benefits of the drug. • In all, neither vaccines nor anti-viral drugs have any reliable evidence that they work against influenza at all. Both are being promoted based entirely on pure wishful thinking, not hard science. • The hype about vaccines provides a false sense of security, taking away attention from other things that really do work to prevent influenza deaths. That’s why, except for “hand washing,” virtually no advice has been offered to the public on preventing influenza beyond vaccines and anti-viral drugs. • There have been no placebo-controlled studies on flu vaccines because the vaccine pushers say such clinical trials would be “unethical.” Thus, there is actually no hard scientific evidence that they work at all. • The “50 percent reduction in mortality” statistic that’s tossed around by vaccine pushers is a total fabrication based on “rubbish” studies (“cohort” studies). • Scrutinizing the existing studies that claim to support vaccines reveals that flu vaccines simply don’t work. And when vaccines aren’t available or the formulation is wrong, there’s no spike in death rates, indicating quite conclusively that these vaccines offer no reduction in mortality. • Flu vaccines only produce antibodies in people who don’t need vaccines. At the same time, they fail to produce antibodies in people who are most vulnerable to flu. Thus, vaccines only work in people who don’t need them. As you can see from all this, the flu vaccine is pure quackery. Those who administer vaccines are, by inference, QUACKS. They claim to have scientific minds, and yet they are the most gullible of all: They will believe almost anything if it’s published in a medical journal, even if it’s complete quackery. Today, countless doctors, nurses and pharmacists across North America and around the world are pushing a medically worthless, scientifically-fabricated chemical injection that offers absolutely no benefit to public health… and yet they’re convinced it’s highly effective! It just goes to show you how easy it is to brainwash people in the field of conventional medicine. They’ve abandoned real science long ago, you know. Now the whole industry is just run on the momentum of dogmatic arrogance and the illusion of authority. From the CDC and FDA on down to the local pharmacist at the corner store, the American medical system is run by some seemingly smart people who have been brainwashed into become full-fledged members of the Cult of Pharmacology where vaccine mythology overrules real science. The vaccine industry is perhaps the greatest medical scam ever pulled off in the history of the world. Don’t fall for it. Reading everything you’ve read here, you might wonder: Why do people get vaccinated at all? The reason is because no one knows whether they work or not, so people keep on taking them “just in case.” It’s exactly the kind of superstitious ritual that “science-minded skeptics” rail against on a regular basis… unless, of course, it involves their vaccines, in which case superstition is all okay. Personally, I’d rather get some vitamin D and have a healthy, functioning immune system. But for those who prefer to play the lotto, gamble in Vegas or bet their lives on medical superstitions, flu vaccines are readily available. So what are you waiting for? Shoot up a few flu vaccines, rub your lucky rabbit’s foot, then spin around clockwise seven times and you, too, may be able to generate enough luck to avoid the flu this winter.